Serving at Marquette’s Volunteer Legal Clinics taught Kate how to handle the emotional responsibilities that come with being a lawyer. She now uses those skills to help clients navigate the difficulties of family law. 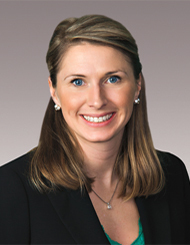 Kate is an attorney with Gagne, McChrystal, De Lorenzo and Burghardt LLC, a firm she co-founded in 2015. Kate has been a volunteer with the Marquette Volunteer Legal Clinic-Family Law at the Milwaukee Justice Center since 2011 and is the former president and founding member of the AIDS Resource Center of Wisconsin junior board. A former teacher, she also volunteers for the Highland Community School. Her father, Michael, Law ’75, is a professor of law at Marquette — but her family ties to the Law School don’t end there. When Kate was in grade school, she wanted to be a cocktail waitress when she grew up because her family watched Cheers on TV. “I accomplished that career goal at 19, so it took me a while after that to figure out my life path,” she jokes.